Yes, you read it right. UM Motorcycles has launched an electric cruiser named the Renegade Thor at the Auto Expo 2018. However, this is not the first time we are seeing it. The electric cruiser first made its debut as a concept at the 2017 EICMA Show in Milan last year. The electric cruiser is priced at Rs 9.9 lakh (ex-showroom) for the CBU unit with a battery range of 270km. 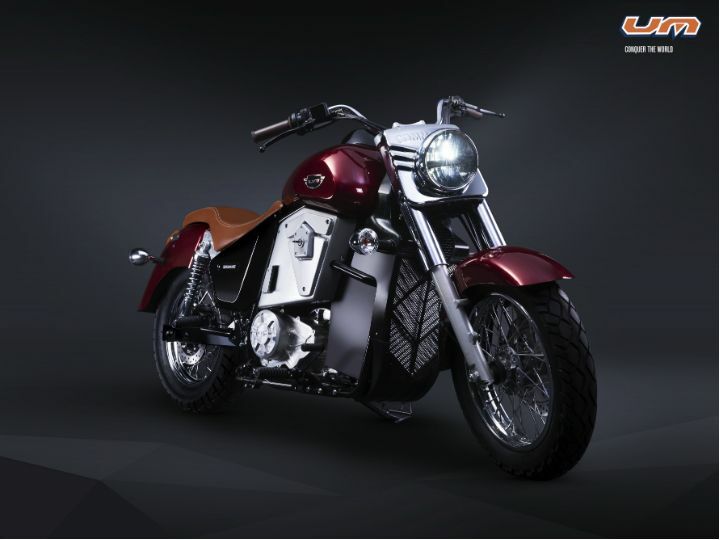 However, UM has stated that the company will soon bring a locally manufactured Renegade Thor at a price of Rs 4.9 lakh with a range of 71km (ex-showroom India). Bookings are scheduled to open in April. The Thor sports a typical cruiser-like design with a round headlamp, raised handlebars, fore-set footpegs and a low saddle. However, instead of a conventional engine, you'll notice a bulky lithium-ion battery sitting in its place. Some of its features include a reverse gear for easy manoeuvring and mobile connectivity via Bluetooth that helps in monitoring all the necessary motorcycle diagnostics. It comes equipped with a liquid-cooled asynchronous three-phase induction motor mated to a 5-speed gearbox. The motor produces 40.7PS of power and 70Nm of torque. According to the company, the Renegade Thor can achieve a top speed of 180kmph. Powering all this is a lithium-polymer battery that can be charged from zero to 80 per cent in just 40 minutes using a fast charger. The Renegade Thor is compatible with Level 1, 2 and 3 electric car chargers. With a Level 2 charger, you can get a charge of 7.5kWh in two hours, 15 kWh in four hours and 27kWh in seven hours. This translates to a range of 170km on 27kWh, 149km on a charge of 15kWh and a range of 81km on 7.5kWh charge. The Thor features 41mm telescopic forks up front and twin adjustable shocks at the rear. Braking is handled by Brembo 280mm front and 240mm rear discs. A dual-channel ABS unit comes as standard here. It gets 17-inch (120/80) front and 15-inch (150/90) rear tyres. UM will offer two years of free charging to all customers. They will also be able to customise their motorcycle with the help of 3D software and 3D printing technology at the factory itself . The first fifty customers will even get an exclusive chance to go to the Tuscany Electric Tour. Stay updated with all the action at the Auto Expo 2018 by logging on to our social media channels. Share your experiences with Renegade Thor?